An artist's rendering of the Chicxulub impact crater on Mexico's Yucatan Peninsula from an asteroid that slammed into the planet some 65 million years ago. The asteroid impact that ended the age of the dinosaurs also released so much carbon dioxide into the atmosphere that the planet warmed up by about 5 degrees Celsius — and the hot spell persisted for roughly 100,000 years. That's according to a new study in the journal Science that offers a cautionary tale about how Earth's climate will react to the carbon dioxide that's being pumped into the atmosphere now by the burning of fossil fuels. 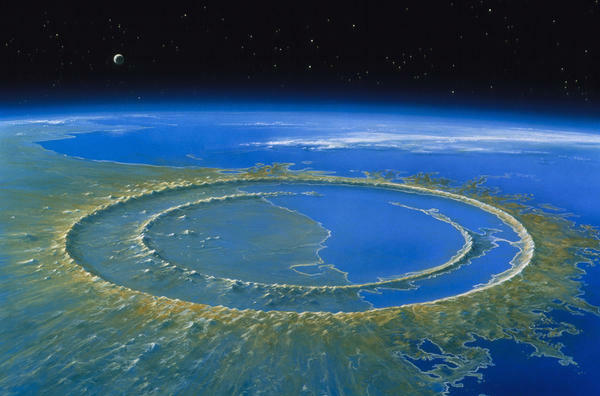 Scientists have long wondered about the long-term environmental effects of the notorious Chicxulub impact that occurred about 65 million years ago, when a space rock more than 5 miles wide slammed into the Yucatan Peninsula. The crash must have produced a blast of intense heat that vaporized rock and set off massive wildfires. A vast cloud of ash and soot then must have blocked the sun for months, years, or decades, ushering in a global winter that killed off plants and animals (including non-avian dinosaurs) in a mass extinction. After the skies cleared, researchers believe the planet must have warmed up because all of those fires and zapped minerals put lots of carbon dioxide in the atmosphere. But evidence of those environmental effects has been hard to discern from the geologic record. "To date, there's really been no good empirical estimates on what temperature is doing following the impact, in terms of hundreds of thousands of years," says Page Quinton, a geologist at the State University of New York at Potsdam. She worked with Ken MacLeod, a paleontologist at the University of Missouri, Columbia, to look at one possible recorder of temperatures — oxygen isotope signatures — from fossils of fish that were alive way back when. The bits of fish remains are so small, they just look like grains of sand or crud. "But under the microscope, they are unequivocally fish fossils. They're these millimeter or half-millimeter long little teeth, and under the microscope they are gorgeous," says MacLeod, adding that they also find tiny fish scales or bits of bone. The researchers painstakingly searched for them in pounds of rock from El Kef, Tunisia, a site that is famous for having well-preserved rock layers that span the time periods both before and after the asteroid impact. Julio Sepulveda, a geologist at the University of Colorado, Boulder, worked with M.H. Negra of the University of Tunis to collect the samples from a deep trench dug into a hillside. "We basically have to go very carefully looking at layer by layer until we find a very characteristic layer that is red in color. It is at most a centimeter thick," Sepulveda says. "That contains all the material that came from the impact itself, from the body that impacted our planet. It's kind of reddish in color, because of the metals that are present." He says his team retrieved rock from several feet below this layer and a couple feet above it. By analyzing the fish fossils inside, researchers determined that global temperatures were stable for a long time before the asteroid impact, but then, afterwards, temperatures quickly rose and stayed about 5 degrees Celsius warmer for about 100,000 years. MacLeod says it's notable that the impact pumped up carbon dioxide over a short time span that, geologically speaking, is comparable to what humans have been doing in burning fossil fuels since the start of the Industrial Revolution. "The atmosphere was loaded for a very brief interval of time, and the consequences of that change in atmospheric composition lasted for 100,000 years," MacLeod says. "So it illustrates, I think, really strongly, even if we went back to 1850 levels of carbon dioxide emission, it's going to take a 100,000 years for the carbon dioxide that we've already put in the atmosphere to cycle through the Earth's systems." Brian Huber, a paleobiologist at the Smithsonian's National Museum of Natural History who wasn't part of the research team, says this paper is real step forward in understanding temperature changes around the time of this mass extinction event. And he agrees that the results have implications for thinking about the future. "I think the stunning result of this is that this temperature warming after the impact persisted for 100,000 years," Huber says. "It's, to me, stunning and a little bit frightening about the course of what happens with burning so much coal, so much petroleum, in just a few decades." A giant asteroid slammed into Earth about 65 million years ago. That impact killed off the dinosaurs. And now scientists say it had another major effect on the planet, one that's a cautionary tale. Here's NPR's Nell Greenfieldboyce. NELL GREENFIELDBOYCE, BYLINE: The so-called Chicxulub asteroid was more than 5 miles wide. When it crashed into our planet, there was chaos. PAGE QUINTON: You had a huge asteroid hitting the ocean at high speed. That's going to cause tsunamis. GREENFIELDBOYCE: Page Quinton is a geologist at the State University of New York in Potsdam. She says the impact also set off massive wildfires and created a global cloud of dust and debris that blocked the sun for months or decades. QUINTON: So on the short term, there's a variety of very, like, quick, scary stuff going down. And the dinosaurs of course, you know, feel that impact. GREENFIELDBOYCE: What she and some colleagues wanted to know was the long-term impact from carbon dioxide. Carbon dioxide, as we all know, is a greenhouse gas, and a lot of it was released by those fires and vaporized rock. Ken MacLeod is a paleontologist at the University of Missouri. He turned to an unusual place to find a record of past temperatures - tiny bits of fossilized fish so tiny they can look like sand or crud. KEN MACLEOD: But under the microscope, they are unequivocally fish fossils. So there are these millimeter-, half-millimeter-long little teeth, and under the microscope, they're gorgeous. There are little scales or bits of bone. GREENFIELDBOYCE: It turns out that their chemistry is different depending on the temperatures when they lived. He and Quinton analyzed fossils from before and after the asteroid impact, and what they found is striking. After the impact, global temperatures rose by about 5 degrees Celsius. MACLEOD: And then it stays at that level for an interval that spans a hundred thousand years. GREENFIELDBOYCE: He sees a lesson here that's relevant for today. MACLEOD: The carbon dioxide that was put into the atmosphere after the impact was probably introduced on the time scale of years to decades, which is pretty comparable to the timescale on which we're introducing CO2. GREENFIELDBOYCE: By burning fossil fuels. He's not the only one to make this connection. Brian Huber is a paleontologist at the Smithsonian's National Museum of Natural History. BRIAN HUBER: We are basically replaying that instantaneous event. GREENFIELDBOYCE: He says how long the warming persisted was stunning, and that's why he found these results in the journal Science a little bit frightening. Nell Greenfieldboyce, NPR News. Transcript provided by NPR, Copyright NPR.